Text: If Tolstoy were alive to-day, it is not unlikely that he would ﬁnd in the “movies” a close approximation to his ideal of art. A direct and universal appeal to the elementary emotions — that was the standard which Tolstoy held up in opposition to the exaggerations, the aberrations, and the obscurities of the Shakespeares, the Goethes, and Richard Wagners. The Russian’s ultimate test of a work of art was its appeal to the untutored but unspoiled peasant. The cinematograph meets this test completely. The Russian mujik is under the spell of the ﬁlms. India’s millions are deserting the story-tellers and the jugglers of the bazaar for the moving-picture shows. China, Peru, and Washington Heights have succumbed to the photo-play. All nations, all ages, all classes, both sexes — it is inconceivable how art can be more popular than that. But the moving-picture show is something more than popular. It is intimate. To an extraordinary extent it is entering into the daily thought of the masses. The good men and women who are fond of writing on literature and life, who are devoting themselves to the task of bringing the drama into touch with the life of the people, must be amazed, and slightly chagrined, at the intensity with which the ﬁlm-play has seized upon the popular imagination. The crowds not only throng to the shows; they talk about them, on street corners, in the cars, and over the hoods of baby carriages. From time to time there have been plays in the regular theatre which have become the theme of general discussion. There have been players whom the public has made its favorites. But the theatre as an institution has hardly impressed itself upon the popular mind in this country. A show was either good or bad, and there it ended with the ordinary theatre-goer. 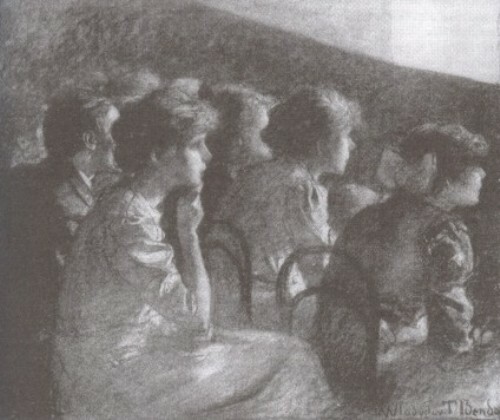 The technique of the theatre was a subject for professionals and “high-brows.” But the crowd discusses the technique of the moving-picture theatre with as much interest as literary salons in Paris or London discuss the minutiae of the higher drama. The crowd knows how the ﬁlms are made, and what it costs to make them, and who the leading actors in the show are. The producers of these shows have achieved an extraordinary triumph. They have converted their entire audience into first-nighters. The interest of the masses in the moving-picture show is even more personal than that. They are not only spectators and critics, but to a very considerable extent they are the authors. Everybody is writing moving-picture scenarios. In part it may have been a real dearth of ideas which induced the film-producers to appeal for contributions to the nation at large. In part it may be excellent business to inoculate the audiences, not excluding children of the grammar grades, with the virus of authorship. The regular theatre draws a not inconsiderable part of its revenue from “students” of the drama who go to the theatre in order to learn how to write plays. The number of those thus directly interested in the moving-picture plays must be enormous. In a very real sense the photo-play then becomes a truly popular art. The operatic composer will strive to give reality — and popularity — to his music by incorporating folk-themes into his score. To the extent that the music of the masses enters into the finished product the composer‘s art is a popular art. The moving-picture showman goes much further than the composer can go by throwing upon the screen the very ideas supplied him by the crowd in the seats. It is not a very high art, this art of the photo-play as created for the masses and largely by them. The authors of the benches reveal the common predilection of the popular taste for the lurid and the fantastic. But in this the moving-picture show merely takes the place of the old-fashioned melodrama. And it has the added advantage of realism. The setting of the photo-play is incomparably more real than anything even a Belasco can give us. It reproduces action in real deserts, on real oceans, in real forests. The heroine walks out of a very actual cottage, down actual steps, and takes a perfectly authentic trolley car to a real department store. The audience knows that these things and the trees, rocks, bridges, boats, and guns are absolutely true to life, because it has often seen the man with the camera at work. To watch one of these exhibitions is like seeing an animated popular magazine without the labor of turning the pages. And like the picture magazine it requires no thought and little attention. Comments: The Nation was, and continues to be, a leading progressive American journal. Invitations to submit ideas for film scenarios were not uncommon at this time, from the smaller film concerns, and publications on how to write film scripts were legion – though it is doubtful that many, if any, of those who read such books ever produced something that a film company would have accepted. David Belasco was an American theatre producer renowned for the naturalistic effects employed in his stage productions. This entry was posted in 1910s, Journals, USA and tagged Audiences, Cinemas. Bookmark the permalink.